Before workers’ compensation programs were adopted across the United States, both employers and employees faced significant and costly challenges when a worker was injured or fell ill at work. Workers often struggled to pay for medical care, resulting in high debt or lack of care, while employers were frustrated by lengthy and expensive litigation. The workers’ compensation system arose to address those needs. For employees, payment of medical bills is perhaps the most crucial tenet of the program, allowing injured workers to obtain the care they need to ensure a maximum recovery and a successful future. The system, however, can be confusing, and many injured workers are unsure of their rights and how to proceed. Here, we examine the payment of medical expenses—what is covered, how to obtain payment, and what to do if you are struggling to get your bills paid. While it is possible to have medical expenses covered by workers’ compensation benefits, Ohio workers have to abide by the rules of the program. Fortunately, state guidelines are relatively lenient and give employees some flexibility. Injured employees may choose their own medical care provider, as long as the provider is certified by the Bureau of Workers Compensation (BWC). A complete list of providers can be found on the BWC website. Payment may be denied for treatment outside of the approved list. Sometimes, workers need emergency treatment. They may be transported directly to a hospital or another provider location. Workers’ compensation benefits can pay these expenses. The patient receives care from an approved provider. The provider sends the bill to the BWC. The BWC sends the bill to the worker’s MCO. The MCO sets or approves the price of the bill and sends it back to the BWC. The BWC sends payment to the MCO. The MCO pays the provider. 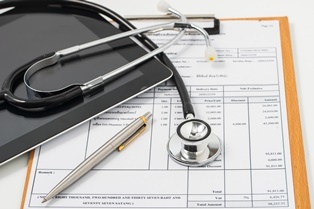 Self-insured employers will pay the medical costs themselves directly to the provider. It is crucial that the injured worker tell all medical care or related providers they are receiving treatment for a work-related injury. This way, providers can send the bill to the appropriate party. Most private health insurers will not cover medical treatment related to a work injury, and the BWC does not reimburse injured workers for any co-pays paid to an insurance company. I paid for my medications at the pharmacy myself. Can I be reimbursed? Yes. An injured worker must have the dispensing pharmacist fill out a form, and the reimbursement will be sent through the BWC. Again, once a claim is approved, medications will be given at no out-of-pocket cost to the injured worker. I submitted my health insurance information for treatment related to my work injury. What should I do now? Your health insurance company may be reimbursed for any medical costs they covered for a work-related injury. This is why it is so important to make sure providers know you are being treated for a work injury. It is possible to remedy the situation, but contact an experienced workers’ compensation attorney who can help you understand your rights and obligations. My provider is sending me bills. What should I do? The BWC discourages providers from billing workers; providers are asked to contact the BWC directly, and they typically follow this practice. And providers are prohibited from seeking any money from a patient for a balance that may remain after the BWC has paid the provider according to the state fee schedule. This is known as balance billing, and the injured worker need not pay. An Ohio workers’ compensation attorney can help ensure that an injured worker is covered by any benefits to avoid confusion about payment. If you or someone you love has suffered a work-related injury or illness, you may be eligible to have your medical bills paid by the Ohio workers’ compensation system. At Monast Law Office, experienced attorney Jim Monast and his staff help ensure that injured workers can secure the care and compensation they deserve. Request a free copy of our helpful e-book, The Workers’ Guide to Injury Compensation in Ohio, to learn more.